On March 30th in 2011, Anaheim Ducks forward Ryan Getzlaf tricked referee Gord Dwyer and the off-ice video review crew when he grabbed a puck that had clearly crossed the goal line and was resting on netminder Ray Emery's arm, and inconspicuously placed it in the crease after the whistle preventing Calgary's tying goal. 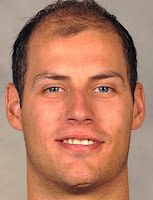 For his encore, Getzlaf denied allegations relating to his suspect role in the incident during a second period intermission television interview. Needless to say, the Flames were none too pleased with the officials' oversight and didn't hesitate to share their thoughts after the game. The controversial call crushed Calgary's playoff hopes as Anaheim scored shortly thereafter and eventually won by a score of 4-2, preventing the Flames from pulling within a point of the final playoff spot with four games to play. Calgary ultimately missed the playoffs by three points.